The book starts with a brief history of Lean from its roots with Deming and Ford, through the ground-breaking work of Ohno (in developing the Toyota Production System) to its renaissance in the West through the work of Womak and Jones and others. The 3x2 rule, which states that companies that adopt this approach enjoy three times the average growth rates and twice the profit margin, compared to their competitors. Seek to perfect the process by iteration. Errors in the service delivered through products being defective or lost. inappropriate systems, either paper-based or automated. This last waste will resonate with those who have worked on IT-automation projects where an inappropriate IT package has been shoe-horned into the business, leaving inefficient manual processes untouched while large swathes of the IT package remain unused or unusable. The bulk of the book consists of a list of tools based around the author’s framework, targeted at experienced Lean practitioners. The author explains that he does not expect all the tools to be used on all engagements; rather it is up to the reader to use their experience to select the best tools for a particular problem. Bicheno also stresses that the Lean process is continuous, iterative process. The section involving Strategy is especially interesting as the author is clearly familiar with executive-level business theories that define and improve value. He advocates Kano analysis as the most powerful technique in for developing products; he has a good section on Scenarios (although his failure to extend this to mention assumption-based planning is little surprising); he outlines how Lean techniques are complementary with Kaplan and Norton’s Balanced Scorecard and credits Jim Collins as succinctly defining the primary characteristics of people management. One of the key parts of Lean is to determine which parts of the business add value and which parts do not – the value-stream. In the section dealing with this, Bicheno gives detailed advice on the tools to do this; here there is overlap with business process modelling. 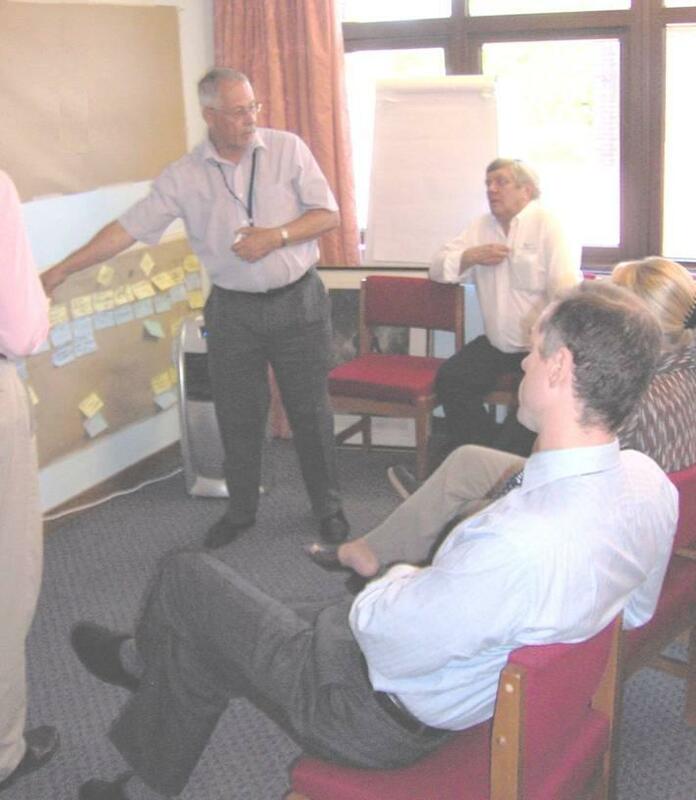 As an aside, the image shows a value-stream mapping workshop in progress. I am facilitating, seated in the foreground. Having set the objectives for the session, I have let the remaining participants take the lead in re-designing their own processes with the aim of eliminating waste activities. Returning to Bicheno, under the Costing section, he makes a plea for simplified accounting practises, naming conventional activity-based accounting as too bureaucratic – perhaps this is part of a trend to simpler mechanism? This is a hugely comprehensive book summarising the latest thinking in Lean. It is biased towards manufacturing – not surprising, as Lean practitioners have only recently turned their attention to the service sector. As so much material is packed in, some of the text is succinct - to the point of terseness at times; no matter, every experienced practitioner will want a copy close to hand. "Value Stream Management": Eight Steps to Planning, Mapping and Sustaining Lean Improvements” by Dan Tapping. Less-experienced practitioners may want to read this in parallel with Bicheno. "Lean Software Development" by Mary and Tom Poppendieck. Traces the connection between Lean thinking and Agile software development. The authors have feet in both camps having written software for concurrent-engineering and supply-chain enterprises. At Agilier, we have had tried-and-tested experience using some of the techniques outlined with special modifications, where appropriate, for application in service industries. This has resulted in both reduced costs and increased capacity for our clients. Please contact us for a no-obligation discussion.